Hi there! 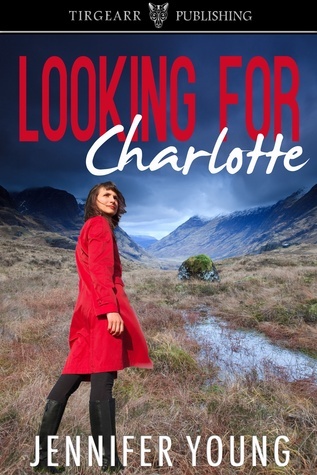 Today I’m getting the word out on LOOKING FOR CHARLOTTE, a contemporary adventure by Jennifer Young who has a graciously popped in to talk a bit about her craft, and the book. Please check out the giveaway as well! She walked alongside the rutted track on the springy heather. This was where Ally had driven in his hired car, alone and knowing himself to be his own daughter’s murderer. How must he have felt? Lonely, of course. Even in the best times of his life Ally was always lonely, resisting all attempts to understand him and his problems, fighting against his perceived failures, his mental weaknesses. She knew them well. She had loved Ally, for a long time. She’d dedicated years of her life to making him happy and then she’d realised that she couldn’t do it. And by then she had a baby, another helpless being, but this time one who couldn’t do anything for herself. So instead of living her life for Ally, she’d lived it for Charlie. And now she had no-one to live it for but herself. She stopped at the edges of the digging, looked down reluctantly. The house lay a few hundred yards beyond; a dog barked, but no-one came out. She was alone. Perhaps Ally had killed Charlie because he was jealous of the attention lavished on her. Perhaps he felt emasculated by a helpless child. And if he had, then that made it her fault. As the tears welled up, she dug a hanky out of her pocket and suppressed them. Her phone was in there, too, so she fished it out and tried again. This time there was a signal, though faint. She rang her mother, but there was no answer and she didn’t leave a message, because everything had changed and she knew she would cry. ‘Oh God. You poor girl. Do you feel better? Suzanne didn’t want to talk any longer. She held the phone face down and shouted to it, ‘I’ve hardly got a signal, Kazzy. But I’m fine. I’ll ring you tomorrow, okay?’ And she ended the call and slipped the phone back in her pocket. Then she began to walk back down to the car. It was true; it was as if Charlie was with her, walking beside her with her tiny toddler’s steps, stooping to touch the flowers and reach out for the butterflies. She would have loved this place. She reached the car, got in, pulled down the mirror again and looked at her sad, old face. Love? What was love? And where was it, buried, deep and lost forever? So now, as Ol’ Blue Eyes was wont to sing, the end is near. This is the final stop on my blog tour for Looking For Charlotte and so I want to talk about endings. Beginning with a confession — getting the ending right is, for me, easily the hardest part of writing a book. Always leave them wanting more, they say. But they also say you shouldn’t leave your reader unsatisfied, feeling that the issues of your plot are unresolved. Any actions have consequences so when your hero sweeps the heroine into his arms or the great detective unmasks the villain…what happens then? How does the heroine deal with the betrayal by her jealous sister which was the heart of the plot? What’s the reaction of the murderer’s innocent, unsuspecting wife? Do you care? And, more importantly, does your reader? But oh, reader. Creep close and let me whisper the truth. I’m really, really bad at endings. I struggle with them. I tear my hair out as I write and rewrite them. I lose sleep over them. Sometimes I even weep with frustration because I just don’t know when to stop. On paper, the ending of Looking For Charlotte ought to have been easy. The plot is based on a true story from America, in which a woman set out to find two murdered teenagers. In my story the woman seeks a dead toddler, the Charlotte of the title. And because it’s a true story the ending was written for me: she found the bodies. I will be honest with you. I lost count of the number of times I changed the ending, trying it this way and that, going back to the original, changing it again. Because I wanted a happy ending but how can there be a happy ending when it involves the tiny body of a murdered child, whether or not it’s found? Of course, I can’t give the ending away so you don’t need to worry about a spoiler. But rather to my surprise found that this, the most tortuous, difficult ending to plot, is in the end the one I like best. And I hope that you like it too. That’s some great insight. Thanks Jennifer! Interested? You can find LOOKING FOR CHARLOTTE on Goodreads, Tirgearr Publishing, Amazon (UK, US) and Smashwords. Click the Rafflecopter link below for your chance to win a backlist title from Jennifer Young. Jennifer Young lives in Edinburgh and writes romance and contemporary women’s fiction. She’s been writing all her life and her first book was published in February 2014, though she’s had short stories published before then. The thing that runs through all her writing is an interest in the world around her. She loves travel and geography and the locations of her stories is always important to her. And of course she loves reading — anything and everything. You can find Jennifer online on Facebook, Twitter, or her website. Make sure to follow the whole tour—the more posts you visit throughout, the more chances you’ll get to enter the giveaway. The tour dates are here.